RAPID CITY, S.D. – Thanks to the 1+1 Giveaway, a local special education teacher has some extra money to help his students learn and have fun. 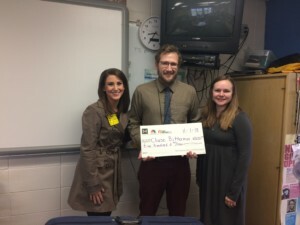 Chase Bitterman is a sixth through eighth grade special education teacher at North Middle School and the recipient of $500 from NewCenter1 and First Interstate Bank. Ellen Vogel is a loan processor from First Interstate Bank. She says that being able to give back to the teachers, and in turn give back to the students, is something the bank loves being a part of. Bitterman says this is something that his kids will remember for a long time. Click here if you would like to nominate a teacher for our next 1+1 Giveaway.